Not to be confused with Mini-DVI. The Mini DisplayPort (MiniDP or mDP) is a miniaturized version of the DisplayPort audio-visual digital interface. This is the pinout for the source-side connector; the sink-side connector pinout will have lanes 0–3 reversed in order, i.e. lane 3 will be on pin 3(n) and 5(p) while lane 0 will be on pin 10(n) and 12(p). It was announced by Apple in October 2008. As of 2013, all new Apple Macintosh computers had the port, as did the LED Cinema Display. [not in citation given] However, in 2016 Apple began phasing out the port and replacing it with the new USB-C connector. The Mini DisplayPort is also fitted to some PC motherboards, and some PC notebooks from Asus, Microsoft, MSI, Lenovo, Toshiba, HP, Dell, and other manufacturers. Unlike its Mini-DVI and Micro-DVI predecessors, the Mini DisplayPort can drive display devices with resolutions up to 2560×1600 (WQXGA) in its DisplayPort 1.1a implementation, and 4096×2160 (4K) in its DisplayPort 1.2 implementation. With an adapter, the Mini DisplayPort can drive display devices with VGA, DVI, or HDMI interfaces. Apple offers a free license for the Mini DisplayPort but they reserve the right to cancel the license should the licensee "commence an action for patent infringement against Apple". Mini DisplayPort's HDCP extension disables playback of certain DRM-encrypted content on any display not designed for it. This includes some content from the iTunes Store which has no such restrictions if played on a Mac without Mini DisplayPort. Apple's Dual-Link DVI or VGA adapters are relatively large and expensive compared to past adapters, and customers have reported problems with them, such as being unable to connect to an external display. Monitors connected to a Mini DisplayPort via these adaptors may have resolution problems or not "wake up" from sleep. 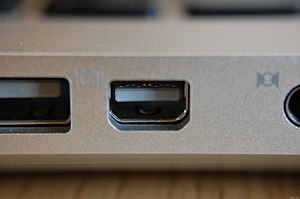 While the DisplayPort specification can support digital audio, the older 2009 line of MacBooks, MacBook Pros, and Mac Minis cannot provide an audio signal through the Mini DisplayPort, and only do so over USB, Firewire, or the audio line out port. (The April 2010 line of MacBook Pro, and July 2010 iMac and later do support this). This can be a problem for users who want to connect their computers to HDTVs using a Mini DisplayPort to HDMI adapter. To work around this issue, some third-party manufacturers have created dual or triple-headed adapters that get power for the adapter from a USB port, video from the Mini DisplayPort, and audio from either the USB port or the optical-out port. Either option terminates with a single female HDMI connector, thus allowing both video and audio to be channeled over the single HDMI cable. In early 2009, VESA announced that Mini DisplayPort would be included in the upcoming DisplayPort 1.2 specification. In the fourth quarter of 2009, VESA announced that the Mini DisplayPort had been adopted. All devices using the Mini DisplayPort must comply with the 1.1a standard. On 7 January 2010, Toshiba introduced Satellite Pro S500, Tecra M11, A11 and S11 notebooks featuring Mini DisplayPort. AMD released a special variant of its Radeon HD 5870 graphics card called the Radeon HD 5870 Eyefinity 6 Edition, which features 2GB GDDR5 memory, higher clock speeds than the original card, and six Mini DisplayPort outputs with a maximum resolution of 5760 × 2160 pixels (a 3×2 grid of 1080p displays). On 13 April 2010, Apple added support for audio out using Mini DisplayPort in their MacBook Pro product line. This allows users to easily connect their Macbook Pros to their HDTVs using a cable adapting Mini DisplayPort to HDMI with full audio and video functionality. On 5 May 2010, HP announced Envy 14 and Envy 17 notebooks with Mini DisplayPort. On 20 October 2010, Dell announced XPS 14, 15, and 17 notebooks with Mini DisplayPort. On 24 February 2011, Apple and Intel announced Thunderbolt, a successor to Mini DisplayPort which adds support for PCI Express data connections while maintaining backwards compatibility with Mini DisplayPort-based peripherals. On 17 May 2011, Lenovo announced the ThinkPad X1 notebook with Mini DisplayPort. In May 2011, Dell released the XPS 15z notebook with Mini DisplayPort. On 15 May 2012, Lenovo announced the ThinkPad notebooks X1 Carbon, Helix, X230, L430, L530, T430s, T430, T530, W530 with Mini DisplayPort. In 2012, Intel shipped the second generation Intel NUC of which the top model with an i5 had a Mini DisplayPort and the top i3 model had Thunderbolt through a Mini DisplayPort. On 9 February 2013, Microsoft released the Surface Tablet, Surface Pro, equipped with Windows 8 Pro and Mini DisplayPort. On 5 July 2013, Asus announced new N Series laptops N550 and N750 with both HDMI and Mini DisplayPort. On 25 July 2013, Dell announced the Precision M3800 mobile workstation with Mini DisplayPort. On 8 August 2013, Dell announced the Latitude E7240 and E7440 business notebooks with Mini DisplayPort. On 9 September 2013, Lenovo announced the ThinkPad X240s, L440, L540, T440, T440s, T440p, T540p and W540 with Mini DisplayPort. On 22 October 2013, Microsoft released the Surface Pro 2, equipped with Windows 8.1 Pro and Mini DisplayPort. On 20 June 2014, Microsoft released the Surface Pro 3 with Mini DisplayPort. On 5 May 2015, Microsoft released the Surface 3 with Mini DisplayPort. On 6 October 2015, Microsoft released the Surface Book, equipped with Windows 10 Pro and Mini DisplayPort. On 10 October 2015, Microsoft released the Surface Pro 4, equipped with Windows 10 Pro and Mini DisplayPort. On 2 June 2016, Gigabyte announced the Aero 14 with Mini DisplayPort. On 11 November 2016, ECS Liva released the Liva Z Mini PC with Mini DisplayPort. On 15 December 2016, Microsoft released the Surface Studio with Mini DisplayPort. On 15 June 2017, Microsoft released the Surface Laptop, equipped with Windows 10 S, and the fifth-generation Surface Pro, equipped with Windows 10 Pro, both with Mini DisplayPort. On 16 October 2018, Microsoft released the Surface Pro 6, equipped with Mini DisplayPort. ^ "New MacBook Family Redefines Notebook Design". Apple.com. 2008-10-14. Archived from the original on 2010-03-16. Retrieved 2008-10-24. ^ "Mini DisplayPort to DVI Adapter". Apple Store. 2008-10-14. Retrieved 2008-10-24. ^ "Mini DisplayPort to Dual-Link DVI Adapter". Apple Store. 2008-10-14. Retrieved 2008-10-24. ^ "Mini DisplayPort to VGA Adapter". Apple Store. 2008-10-14. Retrieved 2008-10-24. ^ "Mini DisplayPort Connector Licensing & Trademark Agreements". Apple Developer Connection. 2008-11-27. Retrieved 2008-11-27. 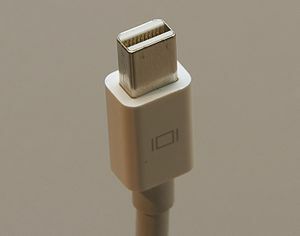 ^ "Apple Mini DisplayPort Connector Implementation License Checklist" (PDF). Apple. Retrieved 2008-12-04. ^ David Chartier (November 17, 2008). "Apple brings HDCP to a new aluminum MacBook near you". Ars Technica. ^ "Apple Mini DisplayPort DRM sparks controversy". November 26, 2008. ^ "EFF: Apple DisplayPort DRM will lead to more piracy". November 26, 2008. ^ "Mini DisplayPort to Dual-Link DVI Adapter". Apple. Retrieved 2008-12-23. ^ "Mini DisplayPort to DVI Adapter". Apple. Retrieved 2009-02-18. ^ "Mini DisplayPort to VGA Adapter". Apple. Retrieved 2009-02-18. ^ a b Chris Foresman (April 13, 2010). "New MacBook Pros support audio over Mini DisplayPort". Ars Technica. Retrieved April 13, 2010. ^ Chris Foresman (July 22, 2009). "Mini DisplayPort no longer a hassle with cables and adapters". Ars Technica. ^ "DisplayPort specification to add Apple's mini connector". MacWorld. 2009-01-14. Retrieved 2009-01-14. ^ "Apple's mini connector set to be part of DisplayPort standard". AppleInsider. 2009-01-13. Retrieved 2009-01-14. ^ "Apple's mini connector set to be part of DisplayPort standard". AppleInsider. 2009-10-13. Retrieved 2009-10-13. ^ "Toshiba Introduces New Satellite, Tecra and Qosmio Laptops Equipped With 2010 Intel Core Processors". 7 January 2010. Archived from the original on 23 March 2010. Retrieved 30 April 2010. ^ "Toshiba Laptop Computers, Notebooks, Netbooks and Accessories - Toshiba Laptops". toshiba.com. ^ "Toshiba Tecra A11 Laptop Computers". Laptops.toshiba.com. Retrieved 2010-04-30. ^ "Toshiba: Leading Innovation". Laptops.toshiba.com. Retrieved 2010-04-30. ^ "HP Envy 14 and 17 officially official, Envy 13 slowly waves goodbye". Engadget. 2010-05-05. Retrieved 2010-05-06. ^ "Dell XPS Series Revamped". infosync. 2010-10-22. Archived from the original on 2011-09-27. Retrieved 2010-12-05. ^ "Thunderbolt Technology: The Fastest Data Connection to Your PC Just Arrived" (Press release). Intel. Feb 24, 2011. Retrieved 2011-02-24. ^ "Introducing the New Surface Pro 6 – Ultra-light and Versatile – Microsoft Surface". Microsoft Store. Retrieved 2019-03-28.